Yesterday, we took advantage of the refreshing sunny weather to wander through Central Park. 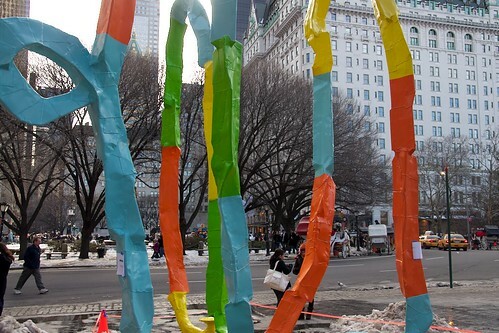 Franz West’s ‘The Ego and the Id’ looked especially vibrant in the sun’s reflection. This sculpture has been on display since July and will be dismantled in March. 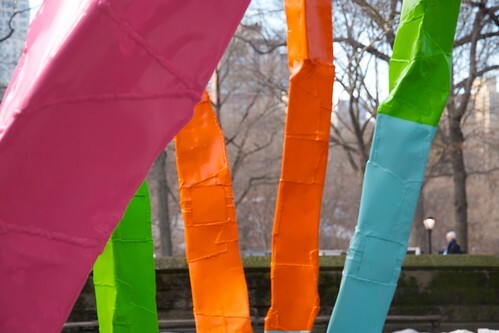 Composed of 20 foot high pieces of aluminum, the colors are quite shocking when contrasted to the gray winter starkness of Central Park and Manhattan. As with any effective piece of outdoor art, different perspectives are easily achieved from wandering through and around the sculpture. I found myself looking at Central Park and Midtown in a slightly different way. According to the Austrian artist, the sculpture is only truly complete when the viewer interacts with the work.